This is a set of 2 spare flywheels for my Flywheelcages. 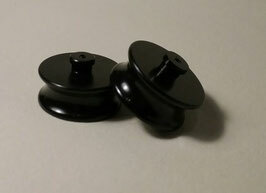 This Flywheels are specially designed for the angled DRS Flywheelcages. They are precision CNC machined! This extremely durable Flywheels are made of high quality german Acetal. These Flywheels will NOT fit into Stock Nerf Flywheelcages!